Featuring this month's most important animal rescues, success stories, fieldwork and global partners. 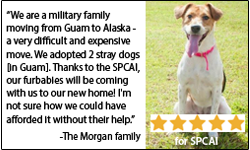 SPCA International's programs have touched the lives of thousands of animals and people. We take countless photos and receive many more from our partners and military service members every year. Now, we finally get to share them with you in a fun, new format - a 16-month calendar! SPCA International is proud to introduce our very first Rescue Calendar, full of photos of happy dogs and cats helped by our programs! Our partners at the Tanzania Animal Welfare Society (TAWESO) labor tirelessly to improve the lives of working donkeys in their country. As part of their efforts, they have been lobbying for the closure of donkey slaughterhouses known for cruel treatment and the killing of donkeys for profit. TAWESO's work has now culminated in the imminent closure of slaughterhouses. In April, our team in Iraq urgently picked up Laurel from a U.S. Naval Base. Laurel’s eye was severely injured, but he never stopped wagging his tail. Laurel exemplified strength, trust and unconditional puppy love. With heavy hearts, we must report that Laurel has passed away due to a serious disease. The details of Laurel’s life and loss are chronicled for all our supporters who were rooting for him. There are 34 species of toucan. Located in Central and South America, the toucan plays an important role in the health of the rainforest by carrying and dropping seeds from the fruit they eat, which helps in replanting. This close relative to the woodpecker builds its nest in hollowed out portions of trees and can lay up to five eggs. The rainbow-billed toucan is the national bird of Belize. Thank you for being subscribed to our email alerts! You may unsubscribe at any time.